. [J]. 地理学报(英文版), 2014, 24(4): 593-611. Wei ZHOU,Chengcheng GANG,Yizhao CHEN,Shaojie MU,Zhengguo SUN,Jianlong LI. 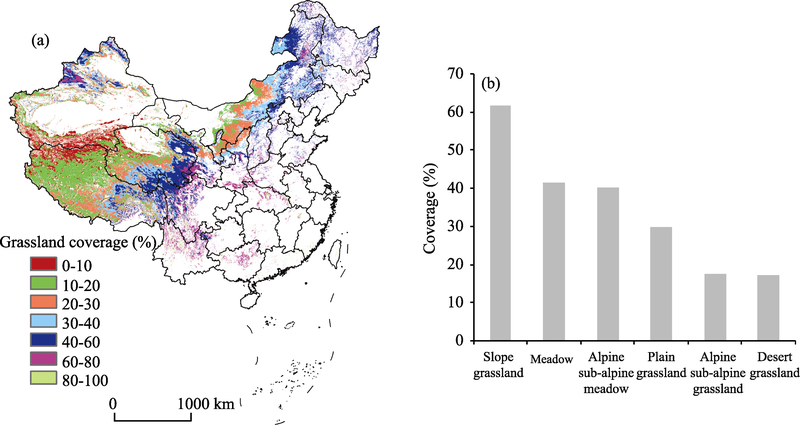 Grassland coverage inter-annual variation and its coupling relation with hydrothermal factors in China during 1982-2010. Journal of Geographical Sciences, 2014, 24(4): 593-611. 1 Chen X, Tan Z, Schwartz M Det al., 2000. 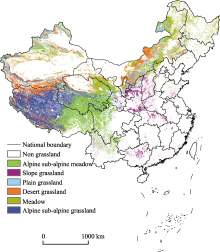 Determining the growing season of land vegetation on the basis of plant phenology and satellite data in northern China.International Journal of Biometeorology, 44(2): 97-101. 3 Christensen L, Coughenour M B, Ellis J Eet al., 2004. Vulnerability of the Asian typical steppe to grazing and climate change.Climatic Change, 63(3): 351-368. 6 Dai S P, Zhang B, Wang H Jet al., 2011. 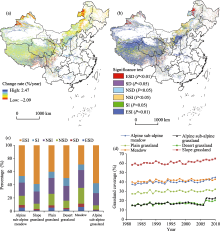 Vegetation cover change and the driving factors over northwest China.Journal of Arid Land, 3(1): 25-33. 9 Gutman G, Ignatov A, 1998. 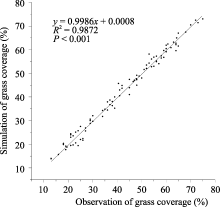 The derivation of the green vegetation fraction from NOAA/AVHRR data for use in numerical weather prediction models.International Journal of Remote Sensing, 19(8): 1533-1543. 10 Hall F G, Huemmrich K F, Goetz S Jet al., 1992. Satellite remote sensing of surface energy balance: Success, failures, and unresolved issues in FIFE. Journal of Geophysical Research:Atmospheres (1984-2012), 97(D17): 19061-19089. 11 Keeling C D, Chin J, Whorf T P, 1996. Increased activity of northern vegetation inferred from atmospheric CO2 measurements.Nature, 382(6587): 146-149. 14 Li Z, Kafatos M, 2000. 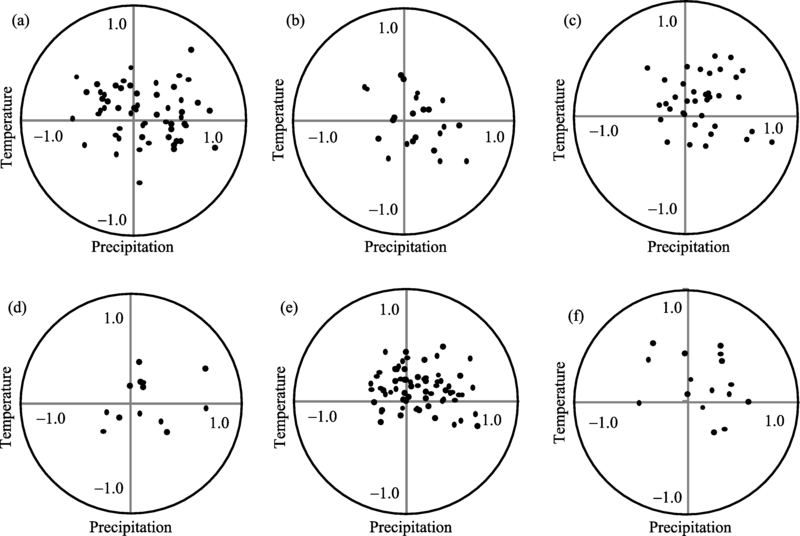 Interannual variability of vegetation in the United States and its relation to El Nino/Southern Oscillation.Remote Sensing of Environment, 71(3): 239-247. 16 Mu S J, Yang H F, Li J Let al., 2013. 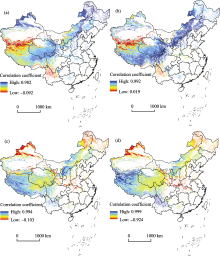 Spatio-temporal dynamics of vegetation coverage and its relationship with climate factors in Inner Mongolia, China.Journal of Geographical Sciences, 23(2): 231-246. 17 Myneni R B, Keeling C D, Tucker C Jet al., 1997. Increased plant growth in the northern high latitudes from 1981 to 1991.Nature, 386(6626): 698-702. 18 Parmesan C, Yohe G, 2003. A globally coherent fingerprint of climate change impacts across natural systems.Nature, 421(6918): 37-42. 20 Piao S L, Fang J Y, Ji Wet al., 2004. 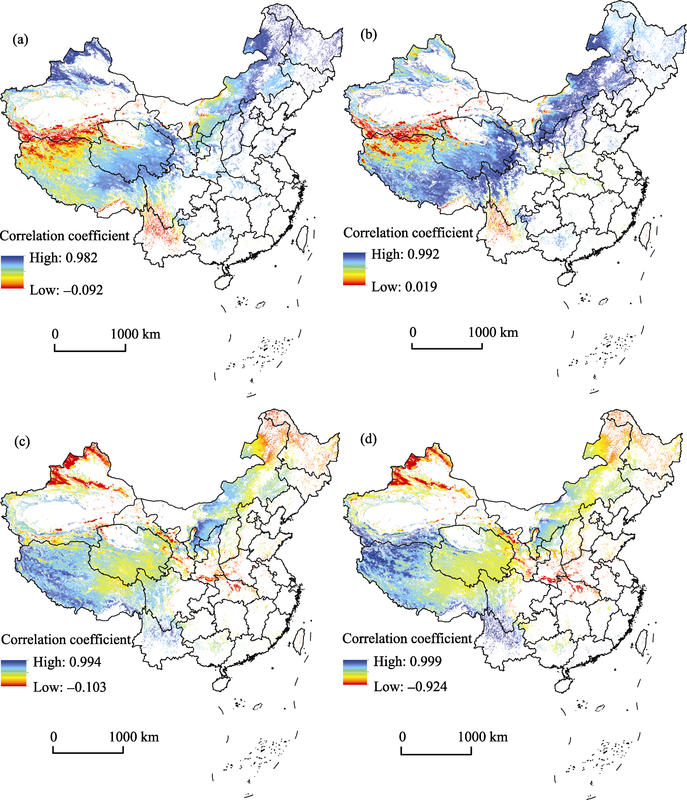 Variation in a satellite-based vegetation index in relation to climate in China.Journal of Vegetation Science, 15(2): 219-226. 21 Piao S L, Mohammat A, Fang J Yet al., 2006. 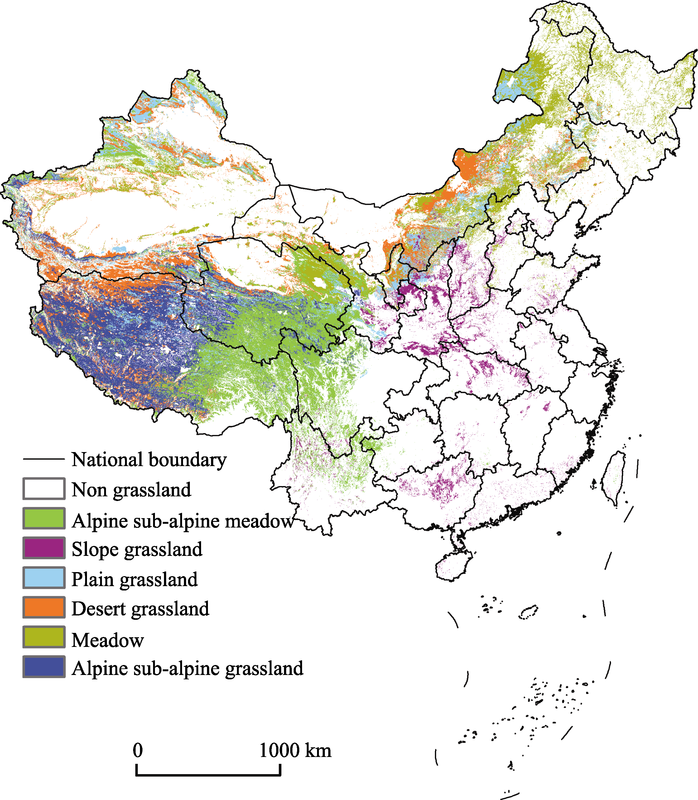 NDVI-based increase in growth of temperate grasslands and its responses to climate changes in China.Global Environmental Change, 16(4): 340-348. 22 Ran Y, Li X, Lu L, 2010. Evaluation of four remote sensing based land cover products over China.International Journal of Remote Sensing, 31(2): 391-401. 24 Roerink G J, Menenti M, Soepboer Wet al., 2003. 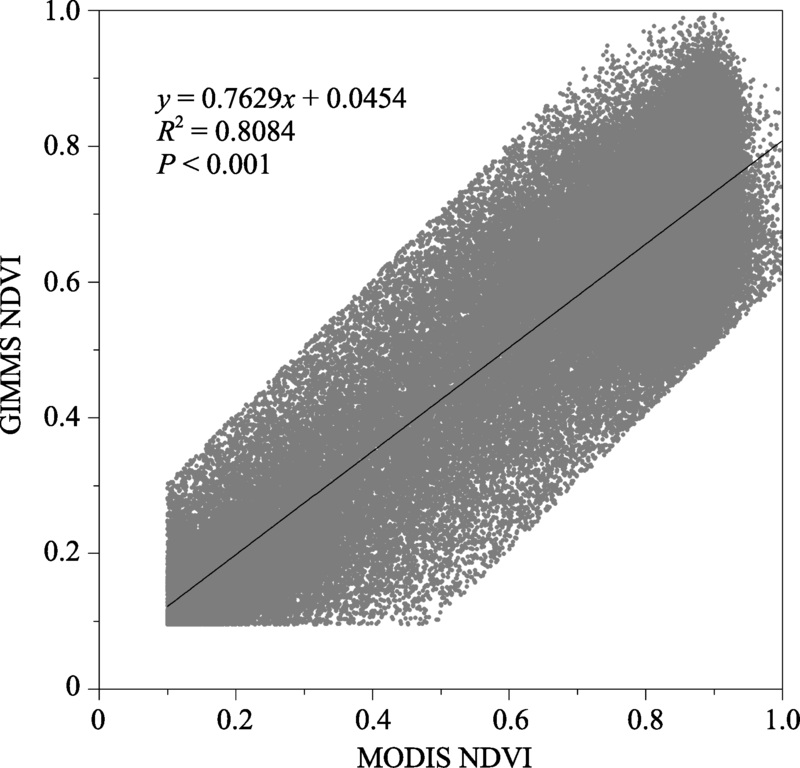 Assessment of climate impact on vegetation dynamics by using remote sensing. Physics and Chemistry of the Earth, Parts A/B/C, 28(1): 103-109. 25 Shi Y, Shen Y, Kang Eet al., 2007. 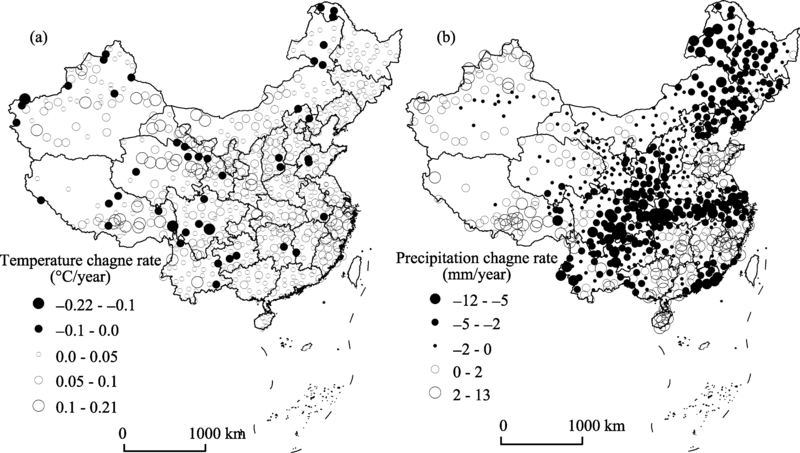 Recent and future climate change in Northwest China.Climatic Change, 80(3/4): 379-393. 27 Sun J, Cheng G W, Li W Pet al., 2013. On the variation of NDVI with the principal climatic elements in the Tibetan Plateau.Remote Sensing, 5(4): 1894-1911. 31 Waker B, Steffen W, 1997. IGBP Science No.1: A Synthesis of GCTE and Related Research. Stockholm: IGBP, 1-24. 33 Weltzin J F, Loik M E, Schwinning Set al., 2003. 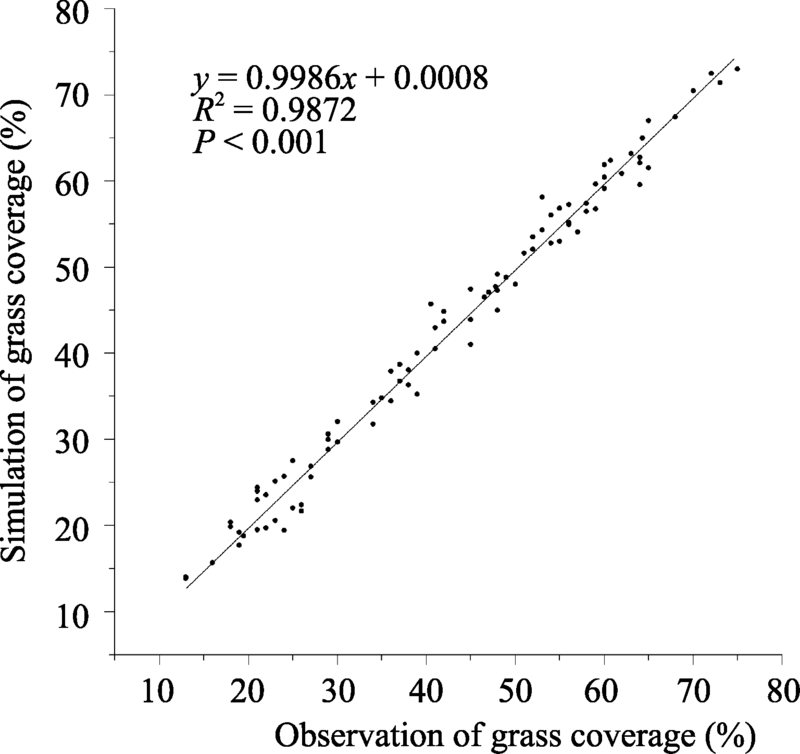 Assessing the response of terrestrial ecosystems to potential changes in precipitation.Bioscience, 53(10): 941-952. 35 Xin Z, Xu J, Zheng W, 2008. 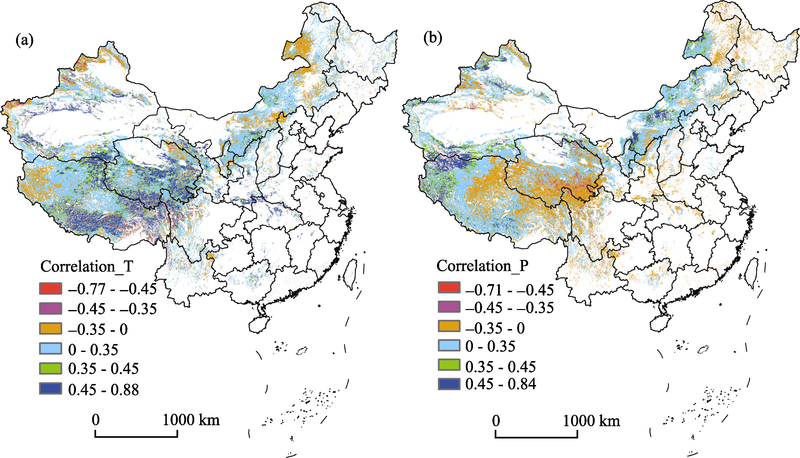 Spatiotemporal variations of vegetation cover on the Chinese Loess Plateau (1981-2006): Impacts of climate changes and human activities.Science in China Series D: Earth Sciences, 51(1): 67-78. 39 Zhang F, Tiyip T, Ding J Let al., 2013. Vegetation fractional coverage change in a typical oasis region in Tarim River Watershed based on remote sensing.Journal of Arid Land, 5(1): 89-101. 40 Zhang G L, Dong J W, Xiao X Met al., 2012. 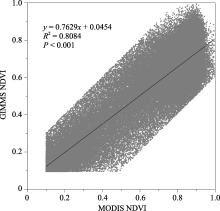 Effectiveness of ecological restoration projects in Horqin Sandy Land, China based on SPOT-VGT NDVI data.Ecological Engineering, 38(1): 20-29. 43 Zhang J, Zhang Q, Yang Let al., 2006. 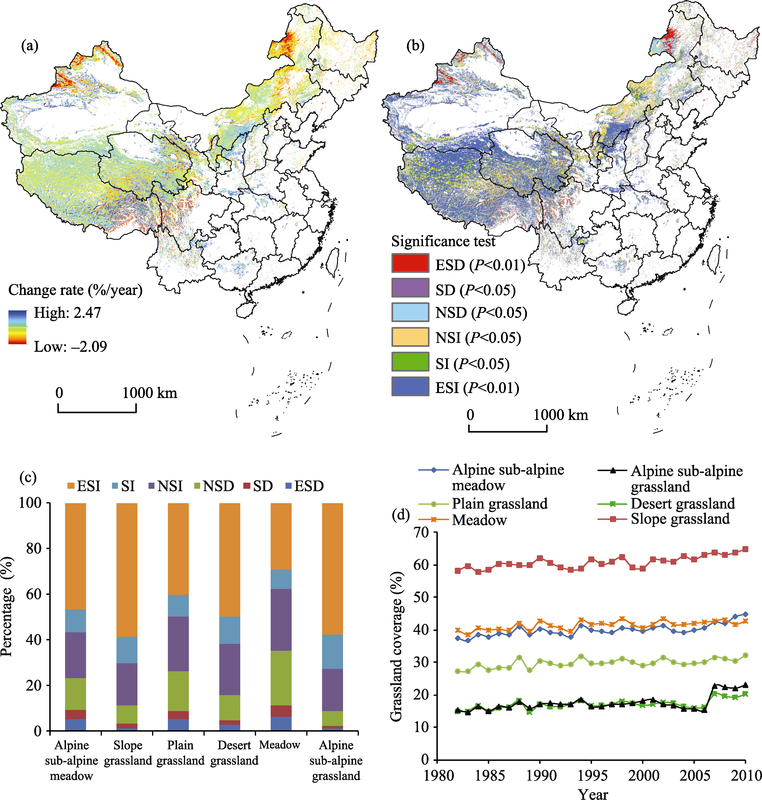 Seasonal characters of regional vegetation activity in response to climate change in West China in recent 20 years. Journal of Geographical Sciences, 16(1): 78-86. 45 Zhou L, Tucker C J, Kaufmann R Ket al., 2001.Variations in northern vegetation activity inferred from satellite data of vegetation index during 1981 to 1999.Journal of Geophysical Research: Atmospheres (1984-2012), 106(D17): 20069-20083.